Plan B | Flickr - Photo Sharing! Current restrictions preclude all fires, even in campground fire rings. 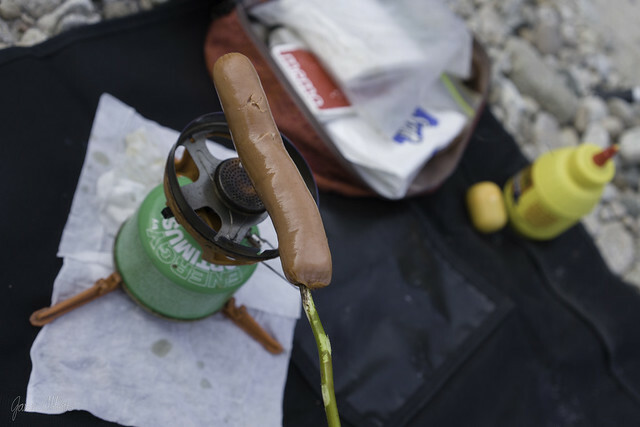 That’s usually a bummer but the evening is fairly warm so we really only need a way to cook our traditional camp meal: hot dogs. I knew we would find green branches along the river so didn’t bother bringing a metal roasting fork. I forgot Brenna hasn’t seen me do this. She watches curiously as I pull the big knife from the bottom of my pack, cut off a green branch and whittle it’s end to a point. “See, it’s easy,” I announce. She seemed suspicious. I light the Jetboil burner and start roasting. Gosh, it’s actually easier than a fire. Maybe we should do this every time.